A futuristic artwork typifies Utah's five-piece's debut album coming after two previous self-released EPs in 2009 and 2013. The band started in 2008 and got its name inspired by "Thy Horror Cosmic", a song contained in 2003's The Black Dahlia Murder's sophomore album "Unhallowed". After a couple of line-up changes, among which the lead vocalist's in 2015, the group steps in High Vibe recordings studio and conveys the impression to have been taking a more focussed direction while keeping the use of a varied sonic palette ranging from Metal to Jazz, Electronic to Classical music. The lyrics get a handle on: humanity being deceived by a godless regime, existences conditioned to someone else's utility and servitude, mankind's purification through a plague, augmentation by mechanization followed by disappointment, demigods, disappearing into an eternal void, eternal life by virtue of stronger and stronger progenies. A melodic and Progressive beginning with an arpeggio and piano lines constitutes the first part of "Era of Deception Pt. I", abruptly interrupted by a Deathcore attack based upon double extreme vocals (growls and shrieks) which keys and guitar solos are added onto. A slowed finalè not lacking in brutality is smoothly joined to the outset of "Era of Deception Pt. II", initially formed like its predecessor in a soft manner: slightly distorted guitars lead to a Jazz part until the powerful drums enter; then a series of tasty arioso axe solos that are neither fast nor too skillful is reinforced by brilliant keyboard touches to conclude the piece. The album gets more crusty and corrosive with the third track "Weavers of Illusion", Deathcore tainted with futuristic keys - partially splintered - and sandpaper screams alternated with sporadic growls. An electronic breakdown prepares the listener to the closing onslaught where the diabolical voices border with Black Metal. The title track starts skimming Fear Factory, quickly veering toward Deathcore and Metalcore with baroque guitar strokes and parts in the vein of Dying Fetus; all of a sudden an Industrial and Symphonic structure 1,000 times more wicked than Marylin Manson on steroids appears, followed by Black and Brutal Death Metal chops, Djent sections and guitar solos mixed low before the keys and the dominating vocals helped by dynamic drumming shape new grim and majestic interludes. "Torch of Prometheus" is a tad more Thrashy and definitely more varied, rich in ups and down, as well as stops and go; this one stands out in that it absorbs all the drummer's energies due to its changes and blitzkrieg blastbeats. At a certain point the composition becomes Prog, then adds a Thrash Metal riff and afterwards turns to Prog Deathcore till a mono axe solo brings the outfit to more traditional territories for them. A brief instrumental intermezzo with acoustic guitars and earth-shaking percussions, "Apostasy" recurs to a Flamenco guitar and later sombre piano notes laying the groundwork to "The Eternal Void", demonical and bloodthirsty after deceiving the listener with a more controlled and delicate first fragment. The angelic keys and the open musical slabs laid by the riffs also contribute in not making it boring and expectable thanks to their palpable contrast. Don't fall for the gentle and elegant inception of "Perennial Eclipse", as the symphonies and the melodies soon leave room for a Metalcore hail of stones along with hammering blasts; later a mid-tempo, replaced by a melodic structure with intrusive keys comes, until palm-muted riffs herald the last bestial aggression broken up by pompous Prog keyboards again. These close the song together with electronic sounds disappearing to make way for sweet yet melancholic classical piano beats. "Harbingers of Pestilence" mostly blends Deathcore, Djent and Prog Metal, trying to make the recipe as heterogeneous as possible and at the same time keeping its songs short enough. The use of two vocalists means they're on the good path, although they could be exploiting their capacities more efficiently. Sometimes the keys and the Prog Metal chips seem derivative from the bands that made history within the genre, while on other occasions they are simply not able to strike the attention and get memorable. 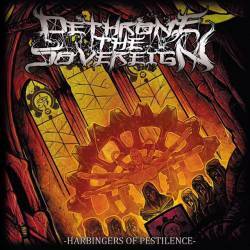 Dethrone The Sovereign are in a process of constant transformation and still haven't found their ideal state; they keep attempting epxeriments as they used to do with the violin in 2013, notwithstanding they sound as if they had a hidden potential to offer, ending up with being uncapable of emerging from the plethora of colleagues. Anyway, fans of The Faceless, Fallujah, Born Of Osiris, Circle Of Contempt, After The Burial, Beyond Creation, Veil Of Maya, Ovid's Withering, Scorned Deity, Tesseract, Periphery, Intervals, Nexilva, A Night in the Abyss, The Human Abstract, So Hideous, Animals As Leaders, Years Spent Cold, Demorior, and Delenda will find more than a handful of interesting elements in this album. Jake 'Diesel' Vancil - v.
Jake Laskowski - k., v.